A Christmas Carol is one of the most adapted books in history. There's been straight adaptations, there's been versions with popular characters in the key roles, there's been parodies; every genre, every medium, everything you could ever think of. And there's a surprising amount of variety in all of these, making finding the one that best captures Dickens classic a hard task. For my money, it's the Alastair Sim starring Scrooge 1951, but a few years ago Robert Zemeckis tried to steal that crown by making what he called a classical version of A Christmas Carol that stayed very true to the book. Look at the image above and tell me that is in any way true to what Dickens imagined. You just can't, can you? Coming in longer than Sim's version but with a fair few plot points dropped, Disney's A Christmas Carol is less faithful than The Muppets version. Throwing old Ebenezer around like a rag doll, there's more action sequences than ever should be in a Scrooge movie (the correct number should be none) and as with The Polar Express before Zemeckis seems blind to motion captures weakness. 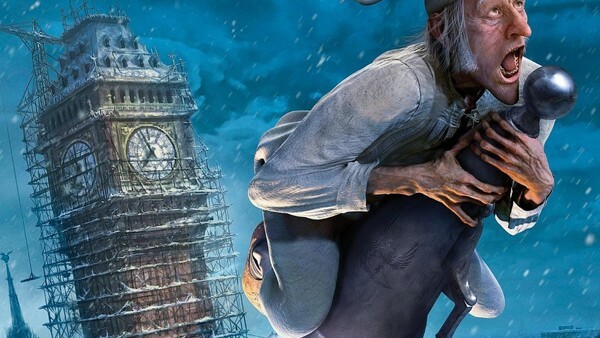 What's most bemusing is that the film takes an active effort to change the book; along with Scrooge himself, the ghosts of Christmas Past, Present and Yet To Come are all played by Jim Carrey. This suggests the ghosts are fragments of his psyche or something, which is definitely not what was originally intended.